This entry was posted in Christianity on June 4, 2018 by Johnny Lin. Of course, no book is perfect (and so I have my quibbles with the two books below), but here are the two career-advice books I’m telling my students and anyone else they need to read! 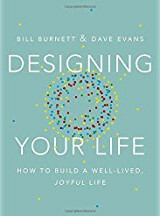 Designing Your Life, by Bill Burnett and Dave Evans (Knopf, 2016): Ostensibly, this book is about utilizing product design principles such as brainstorming, prototyping, etc. to help you plan your life. And it is. But, in my mind, the two greatest things about this book is (1) it tells you how to get unstuck, if you don’t know what to do for a career, and (2) it tells you how to do networking that enables you to figure out what to do and to find a position to enable you to do that kind of work. And, perhaps best of all, it tells you exactly how to go about getting unstuck, do networking, and the other tasks that Burnett and Evans describe. Unlike other books where the advice is so general as to be anodyne—”reach out to your network,” “come up with a list of options”—the authors tell you what kind of table or chart to create, what to write in one kind of email versus another, etc. In short, I wish I had read these two books when I started my career! Whether you’re just starting out on your career or are an old hand, you’ll gain skills and a system to come up with and find the career for you! This entry was posted in Careers on September 27, 2017 by Johnny Lin. This entry was posted in Mac OS X, Ubuntu Linux on August 19, 2014 by Johnny Lin. Start a new iMovie HD project. Import the video into iMovie HD (File -> Import). Drag the imported clip into the video timeline. Select Quicktime, then Expert Settings. After clicking Share, when the dialog box comes up, select Use: Broadband – High. This will give the following settings: H.264 compression, High quality, 150 key frame rate, 672 kbits/sec bitrate, 480×360 dimensions. This entry was posted in Mac OS X on December 16, 2011 by Johnny Lin. This entry was posted in Ubuntu Linux on October 12, 2011 by Johnny Lin. This entry was posted in Ubuntu Linux on April 9, 2011 by Johnny Lin.